I really don't think January 1st is the beginning of a new year. For us, the new year begins sometime in August, whenever the first day of school falls. Because we are teachers, you know. Well, I'm a former teacher, but in my head that is what I am even though I let my teaching license expire. So technically I'm not, but it makes me feel good. So I'm a teacher. Anyways, we operate on semesters: Fall semester, Spring semester, Summer break. So Fall semester starts the new year and is when we try new things, what some of you may call "make resolutions." Do meal planning for a while. (That one never lasts) Make a new budget. Change up the morning routine. Like, this year you will put your own socks on! Or, this year if you can't find your shoes in the morning I will make good on my threat to send you to school barefoot! We will rise early to sip our coffee together while we gaze lovingly into each other's eyes and watch the sunrise. That's a lie. It's never even crossed my mind until right now. Anyways, 11:59 pm December 31st is just a different minute from 12:00 am January 1st. That's all. But this year, I am starting a bit of a new season, which I will write about in more detail soon. I am no longer working outside the house part time. Which means when the Baby goes to preK three mornings a week, I have three mornings a week to myself. DID YOU CATCH THAT??? Three mornings a week ALONE. To MYSELF. I can hardly type those words because my hands are shaking with excitement. I know they will somehow find me, (see this) but it is exciting to think about. It is completely new for me to not have a job or a child, so I decided to make a bit of a plan. You might call it resolutions, although it really honestly just happened to fall at this time of year. 1. 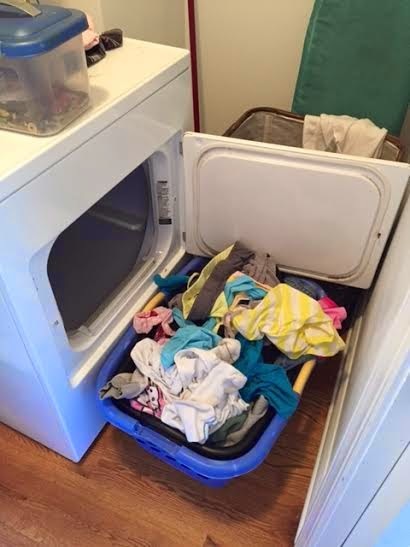 I will fold the clothes the instant the dryer stops like my mom and her mom before her taught me to do. This is going horribly. I was also instructed to never leave the house with a dryer running as that is the most common cause of house fires. (Is that true? I bet it isn't. Mom.) But how else am I to get all the laundry done? Plus our washer is totally spastic (MY NEW ONE COMES WEDNESDAY!!!!!!) so I can never time the laundry. At least I pulled it out of the dryer. 2. I will meet the totally realistic goals set on my Fitbit. 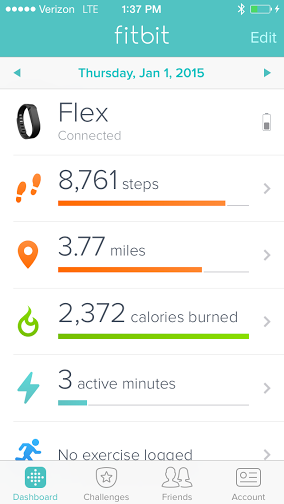 I got a Fitbit with some Christmas money, and it is so great! I really really love it! I knew if I made some resolution about rising early to run three miles I would break it the first day, but this seemed more doable. The goals I set that I care about are 10,000 steps each day and 5 miles each day. See picture. Notice date. Might as well have made the rise early resolution. 3. I will not be impatient with my husband. This has been an issue our entire marriage. I am total Type A, always coming up with stuff to do, what needs to be done next, and by "next" I mean "NOW." It makes me say unkind things I don't mean and want to chew off my own tongue. This morning, I called him specifically to gripe about how I couldn't make the DVD player work and I hated the new sound bar he got for Christmas because it was preventing me from doing whatever and when he said it was simple and patiently tried to walk me through the process of getting it to work I got mad. (He was trying to HELP!) I told him I was too frustrated to talk and hung up. And then I called him back to gripe some more. And then I called him back to beg his forgiveness. Which he is always quick to give because he is the most wonderful person to ever walk the face of the earth. You are so lucky you are not married to me. 4. 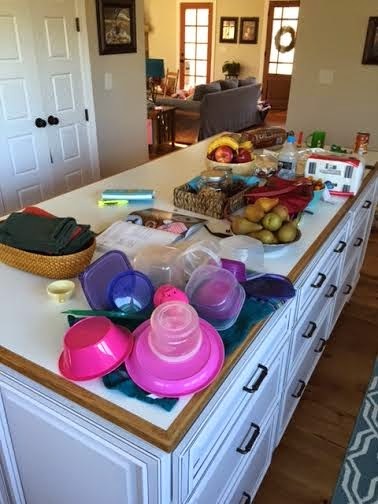 We will all pick up things and put them away as soon as we are done using them. It makes me laugh a lot that I thought that was an achievable goal for even one second. I walked around right before I sat down to type this and took pictures. 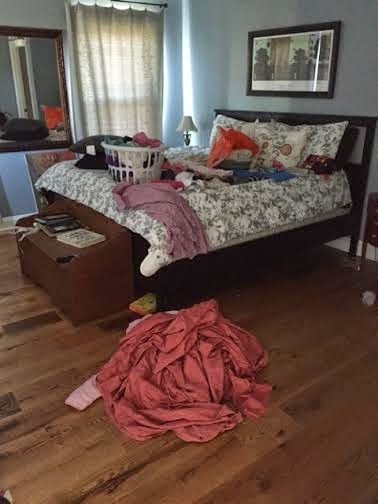 And I didn't even photo the girls' bedroom. This is how I left the DVD cabinet after the impatient incident. 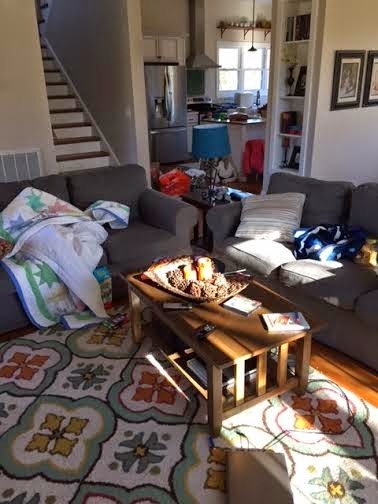 Is there a counter under there? No way. You sure can't see it if there is. Blankets strewn about from our late night watching of Downton Abby. And games we played three days ago. 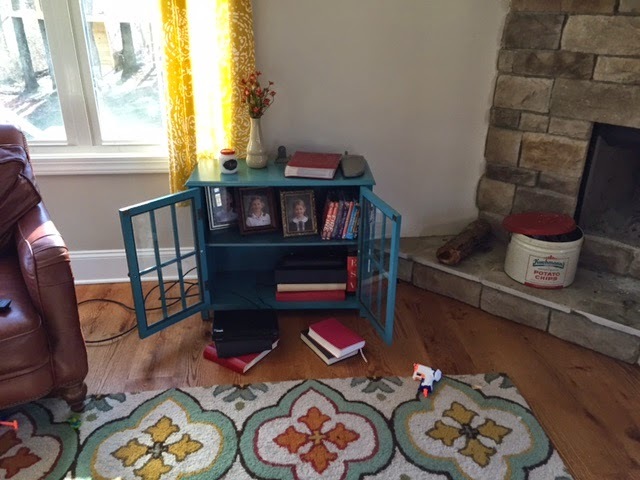 Bean bag goes in girls' room. Doritos do not go on rocking chair. 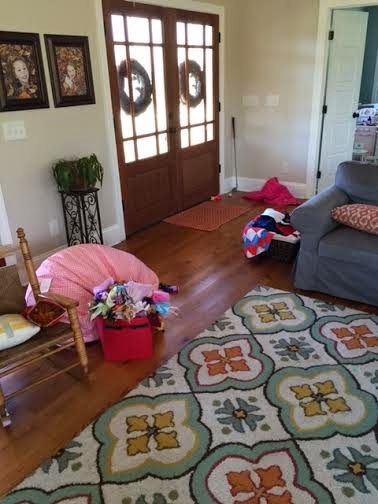 Pink coat on floor should at minimum be on mudroom floor. Ignore the plant. We do. Box of barbies. Ugh. Preston's least favorite thing next to glitter. 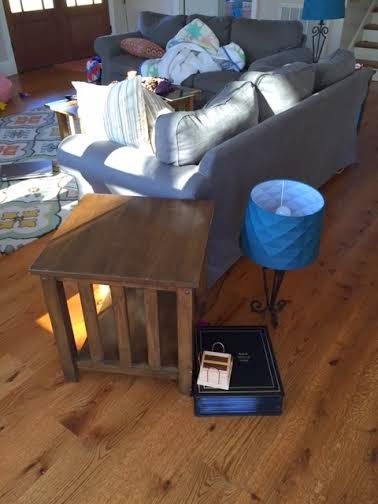 Wedding album, lamp and coasters on floor to clear end table for Barbie Ball. Barbie Ball is over but the things weren't put back. 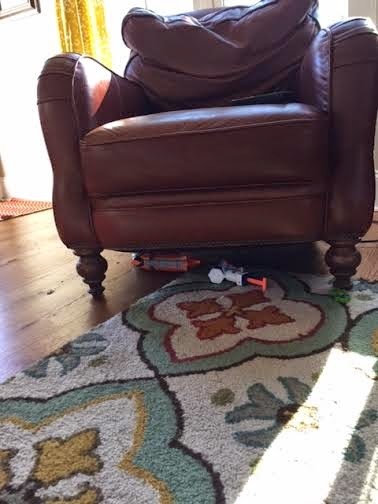 Nerf guns under the chair. Where they belong. 5. I will change all the bedsheets once a week, even on the bunk beds. Totally kidding! Just checking to see if you are still reading. 6. I will make our bed everyday. It's made! But only today. Look past the (not folded) laundry piles. So obviously I'm not off to a great start. Not one single resolution has been kept. But here's the take away - at least for me: I am not perfect. If I had been, Jesus wouldn't have been necessary. What a comfort. He has already been perfect for me. But I know God isn't content to leave me in my sin and is working a good work in me everyday that He will bring to completion. So I will continue to wake up, pray for grace, drink from His Word, and get on with it.